The Single Standard 1929 - 73 min. - Color Genre: Drama Sub-Genre: Romance Not Rated Country: USA LaserDisc Movie Storyline: In this silent film, the wealthy Arden Stuart (Greta Garbo) turns her back on her social position, fortune, and a high-class suitor in order to search for a relationship where man and woman act as equals. The Kiss 1929 - 64 min. 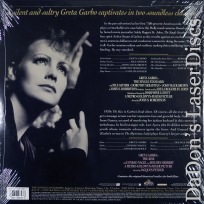 - Black and White Genre: Drama Sub-Genre: Romance Not Rated Country: USA LaserDisc Movie Review: Greta Garbo's last silent film is as fascinating for its elegant costumes and art-deco surroundings as it is for its storyline. Garbo is trapped in a go-nowhere marriage with much-older Anders Randolph. She is in love with Conrad Nagel, but Randolph's jealousy is not aroused until young Lew Ayres, suffering from puppy love, steals a kiss from Garbo. Randolph attempts to murder Ayres, but is prevented from doing so by Garbo, who kills her husband to defend the innocent young swain. During Garbo's trial, she refuses to explain her motivation for killing Randolph, out of fear of disgracing Ayres. But true love Nagel, who through an incredible turn of events is the defense attorney, manages to save both Garbo and Ayres--and to claim Garbo as his bride in the finale. Surprisingly short for a Garbo vehicle, The Kiss is a prime example of the silent film at its zenith, telling a "talking picture" story in purely pantomimic terms, and doing so with complete success.